CityVille is a city sim from Zynga. In CityVille, the player governs as the mayor of a city, built and managed by the player. Players can place buildings and facilities on an isometric map. After building the city, players manage them by collecting rent, restocking stores, collecting goods from factories, etc. Each action costs energy, a limited resource which continuously slowly regenerates. 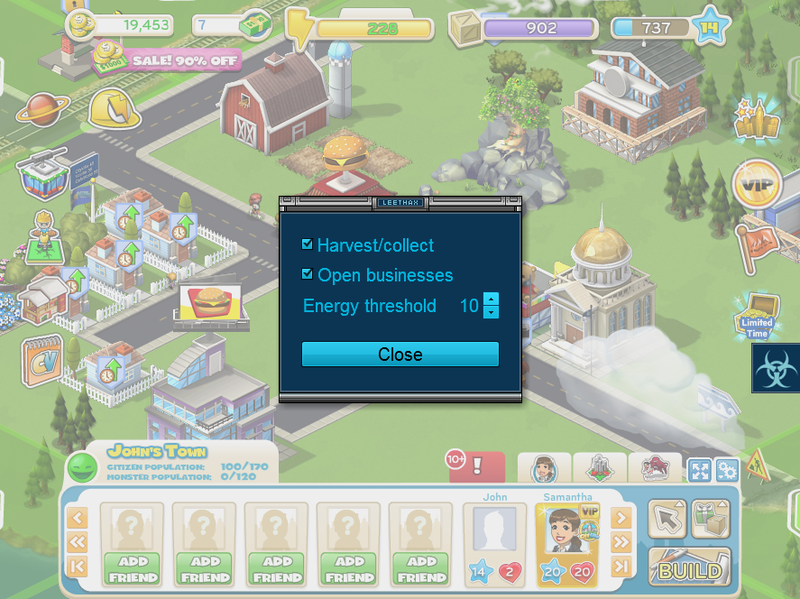 CityVille is a city simulation game, similar to Maxis’ SimCity series. The game was originally released in December 2010. A sequel (CityVille 2) was released in November 2012, however it was shut down in March 2013. There is no way to directly cheat the amount of energy, coins, City Cash etc. However, with our cheat you can leave the game running, and the game will automatically earn coins and experience while you’re away. For best results, we recommend that you leave only those buildings so that used energy to “harvest” them matches your energy regeneration rate. For example, if you get 1 energy every few minutes, and you have several houses that you can collect every 5 minutes, you can only collect from 1 house every time. If you collect from more than 1 house every 5 minutes, you will run out of energy quickly. 1 energy every 5 minutes means 12 energy every hour. If you have 12 houses that give you income every hour, you can collect from all of them without ever running out of energy. Houses that give you income every hour are better than those that give you income every minute, because the amount of money earned per collection is higher, and collections are limited by energy. The same goes for businesses. Businesses that take many minutes to serve their quota of customers may be more efficient. Store away buildings that give you money every 5 minutes. Store away businesses that give you little money per restock. If you have a lot of buildings (10 or more) that give you money every hour, store them away too. Leave the game open. When you come back, disable both options to stop the bot. cheats write "initializing ..." is a bug? make money only watching videos, surveys, tasks or referring new people easy to earn. legit page you can earn points or money is your choice every 1000 points you can get a 10 facebook credits. I need a hack for pet rescue saga please!!!!!!!!! !